The WW100 commemorations have begun in New Zealand and in many small towns like Thames. 2015 will be a time of reflection for many, as our thoughts will turn to WWI and the plight of our soldiers on the 25th April 1915. This will be the hundredth anniversary of the Gallipoli landings. Through the war years 1914 to 1918 (and beyond), Thames lost many young men on the battlefield, and back home as a result of war injuries. Thames is preparing for ANZAC Day 2015. The Peace Memorial has been cleaned and a new track to the Monument had been developed. Considerable work as been done on the WWI Memorial Arch, at the entrance of the old Waiokaraka School, now the Thames Historical Museum. 2014 has been a big year for many of us, with the recent launch of our book: From Gold Mine To Firing Line: "The Thames" and the Great War 1914-1918, edited by Meghan Hawkes. If you want to know more about the book - go to The Treasury website. New Zealand War Contingent Association. New Zealand War Contingent Association :"Also we will make promise so long as the Blood endures ... Rudyard Kipling. [ca 1915]..
More on Waihi beach, a favourite for many Thamesite, especially before the Kopu-Hikuai road opened up the eastern side of the Coromandel Peninsula. Description: ON THE COAST, NEAR BOWENTOWN, TAURANGA HARBOUR, EAST COAST, NORTH ISLAND. When the tide was low at Bowentown, there was always the surf at Waihi Beach to swim in. JOYS OF SURFING AT WAIHI BEACH: A MERRY BATHING PARTY IN THE BREAKERS. PROGRESSIVE OF A POPULAR NORTH ISLAND SUMMER SEASIDE RESORT: ELECTRIC POWER SUPPLY OFFICIALLY SWITCHED ON IN THE WAIHI BEACH AREA . 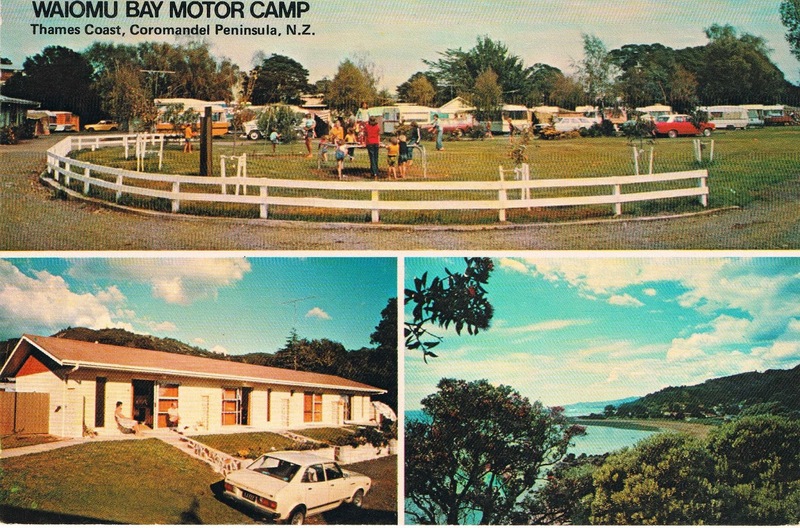 Description A motorists' canvastown on the ocean foreshore at popular Waihi Beach. 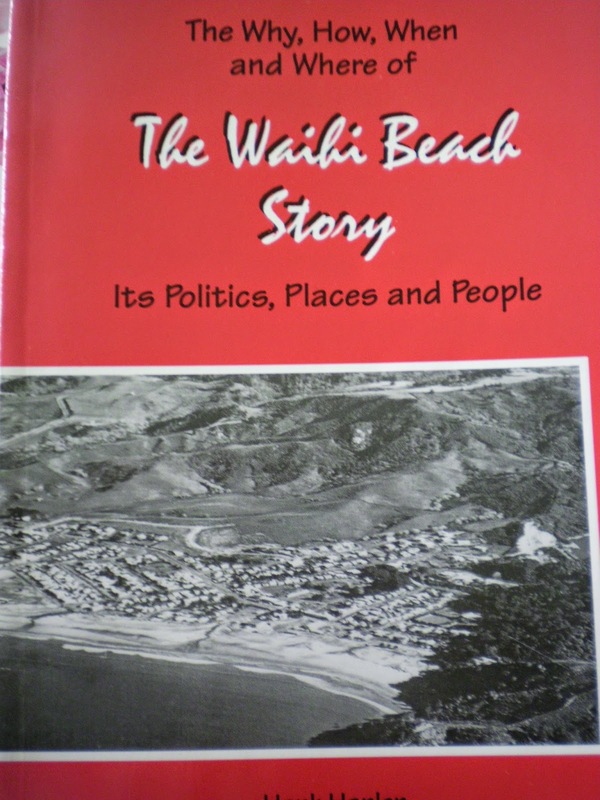 Looking for Information on Waihi & Waihi Beach? What was happening in Thames one hundred years ago? Death: Jane Blacklock WALTERS (aged 83 years), had died 30 December at her Matatoki residence. Her funeral was taking place on New Years Day afternoon at Tararu Cemetery, Tararu. In Memoriam: Notices inserted for William MARTIN who had passed away 31 December 1912 and Eugene Clinch O'SULLIVAN who had died suddenly at Thames January 1st 1914. Trip to Auckland: If you needed to be in Auckland for New Years Day, there was still room on the Wakatere leaving at 6.30pm. New Years Day Activities: You could take Kerby's Launch from the Shortland Wharf to the Pipiroa Picnic and Sports Day. Household Hints: One Teaspoon of vinegar, is a substitute for an egg, always make a cake light if made using dripping instead of butter. Make Cabbage digestible, by replacing hot water when half boiled. Always close down the piano at night or on damp days. Open on bright days and let sun shine on ivory keys to stop yellowing. Visitors to Thames: Many people were visiting for the holidays. Mr & Mrs Thomas GILLAN were visiting from Owharoa, where he worked as Manager of the Rising Sun Mine. Mr A J Hartley was visiting from Temuka and inspecting the land on the Hauraki Plains. Thames Coast bathers were warned to watch for sharks. A 14 footer had recently been seen on the shoreline. Later in the paper, there was some good news that a couple of smaller sharks had been caught by Mr THORNTON. Daniel Doolan had committed suicide at Patetonga, his inquest had just been completed. Thames Bakers were asking for prompt payment of accounts due to the rising costs of flour. War News: Several pages were dedicated to keeping the reader up-to-date with the war news from Europe. 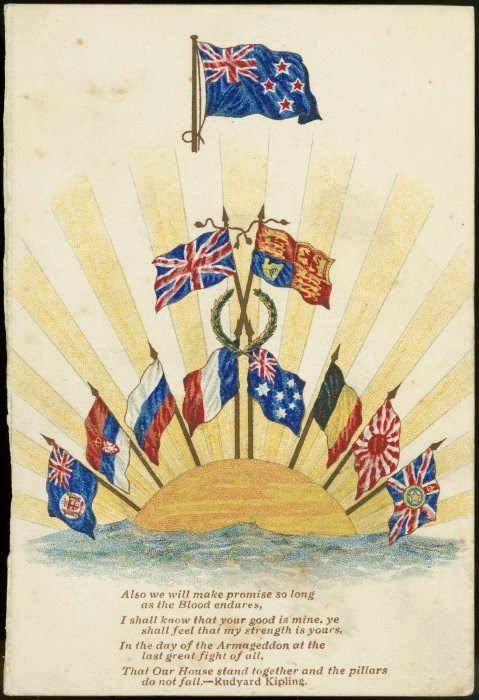 Headlines included: The Germans Repulsed; Austrians Driven Back; and news that the New Zealand Contingent formed in England had arrived in Alexandria. 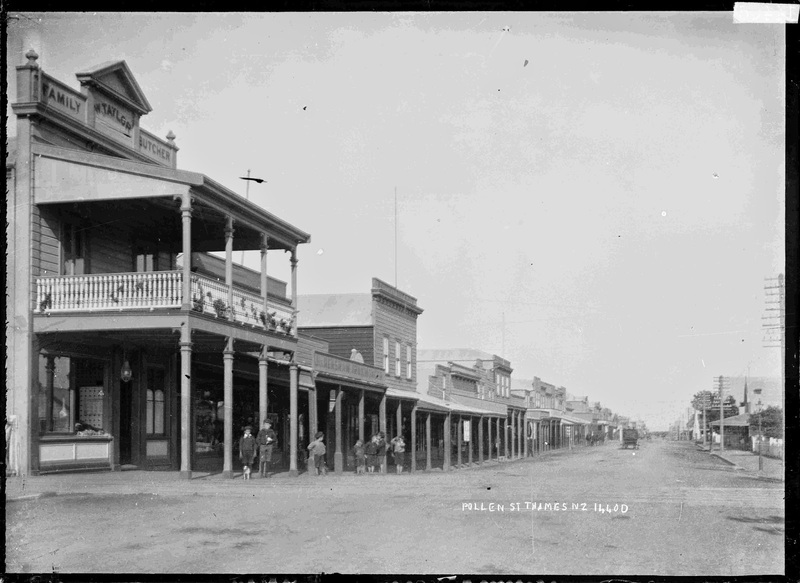 Pahau Street formed the boundary for the Thames Goldfield towns of Shortland and Grahamstown. The photo below is taken just south of the Pahau and Pollen Street intersects, outside the St James' Presbyterian Church. View looking down Pollen Street with William Taylor's family butcher shop in the foreground on the left. Next door is James Renshaw, ironmonger. A chemist's shop is a little further down the street. The other retail premises can not be identified. A group of boys are standing on the pavement looking at the photographer, William A Price. Taken ca 1900. Looking south down Pollen Street, from the Karaka Creek (which runs under the street). W Taylor's butcher shop is now the site of the Golden Dragon Restaurant, adjacent to the Karaka Creek Stream. Next south on the left in the WINZ offices then the two storied building is Whitehead's old shoe shop. Directly opposite on the right is Walter Street that heads to the sea, across Queen Street. 2008 view of the Karaka Creek, note the large channel that has been built as part of the flood protection. There were hundreds and hundreds of claims on the Thames Goldfield. One of the busiest areas was up the Karaka. One such claim was the HALCYON. 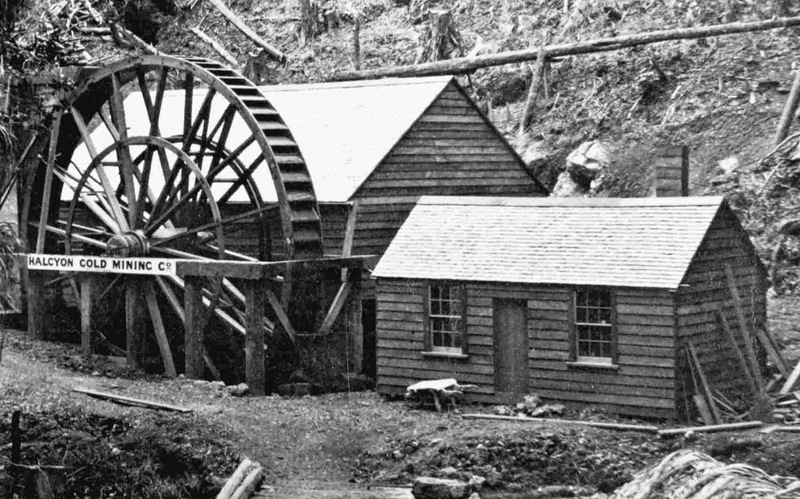 The Thames Miners' Guide reads: THE HALCYON GOLD MINING COMPANY, Karaka Creek. Nominal capital £5,000 in 1,000 shares of £5 each. Amount paid up £2,500. Application to register, July, 1868. Interim Manager, T. B. Gipps. 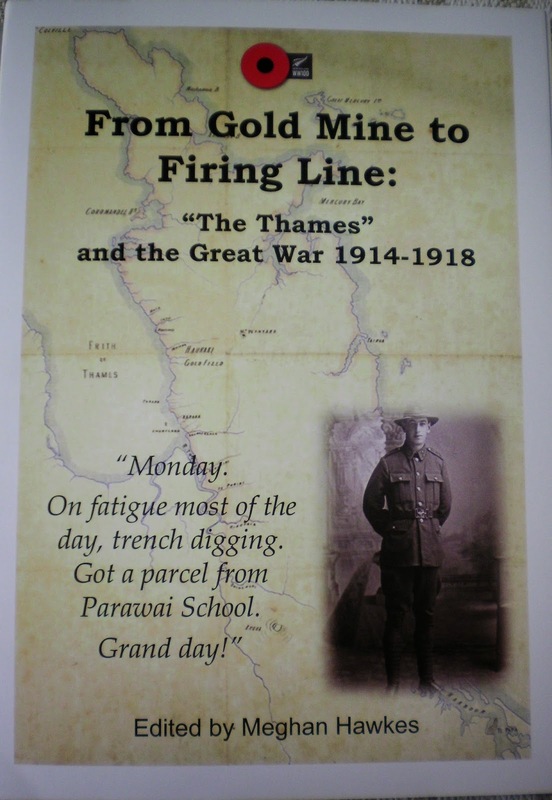 In Downey's book, Gold-Mines of the Hauraki District an overview of the claim is given. 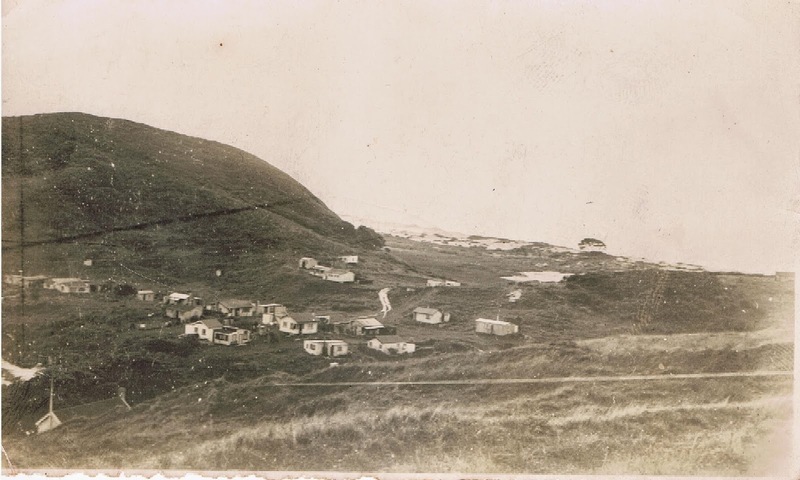 Located above the Hokianga Claim, the Halcyon Claim was initially worked by "a company of the same name, which erected a battery on it, and is said to have some good returns." 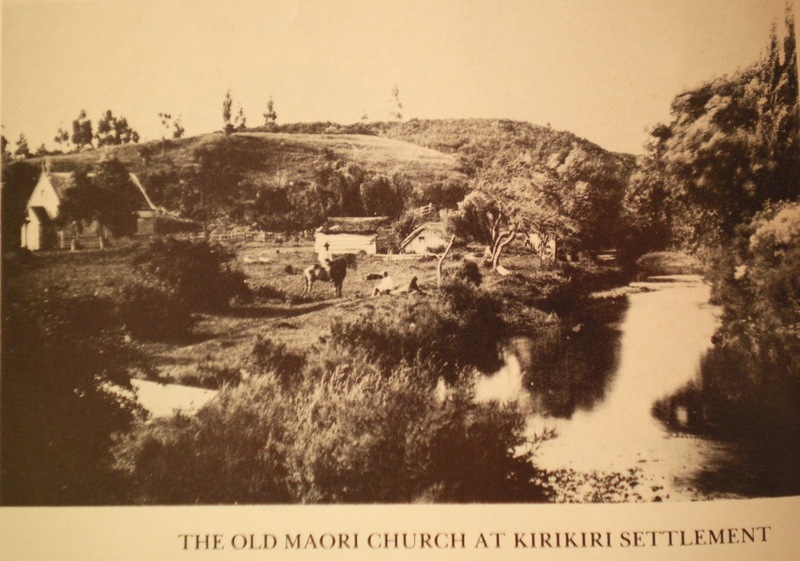 From 1877 to 1880 the claim was worked as the Karaka. The claim then was not worked again until 1891. Later in 1906 another Halycon Gold-mining Company was formed to work the claim - with only a yield of 64oz bullion, valued at 170 Pounds! 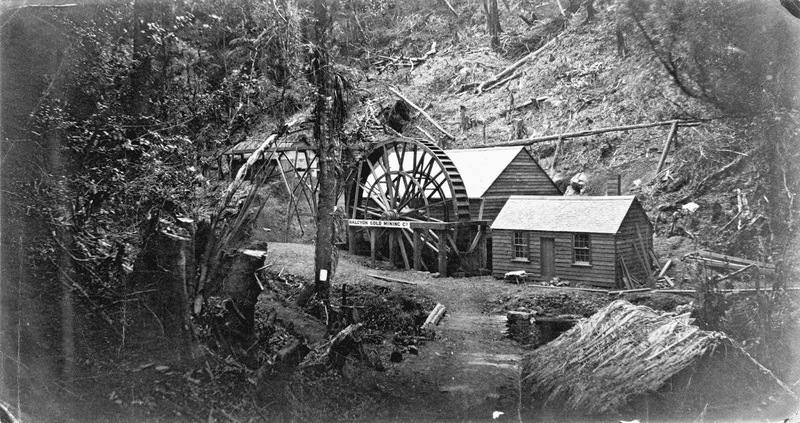 Description: View of the Halcyon Gold Mining Company, Karaka Creek, Thames photographed by an unknown photographer in the 1870s. 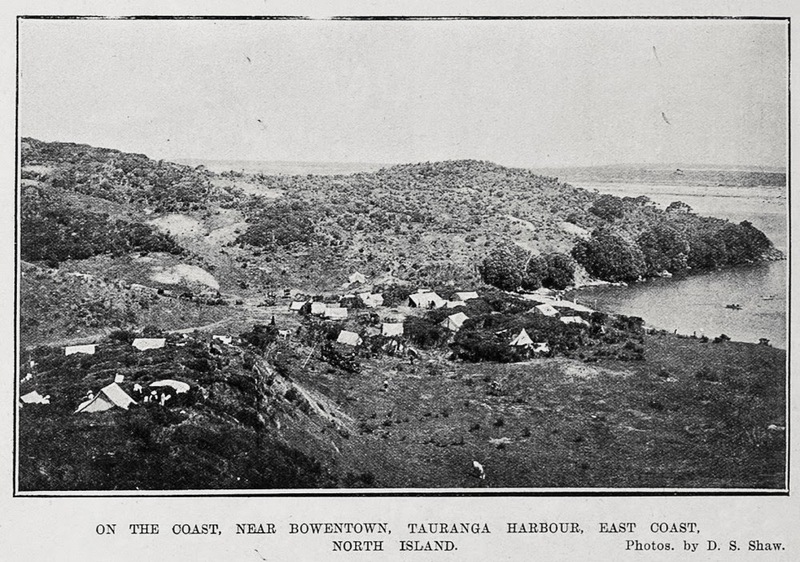 The claim existed until 1877 when its name changed to the Karaka. In 1868 Reverend Viscesimus Lush, the first vicar of Thames, visited the claim. The name reverted to Halcyon in 1906. 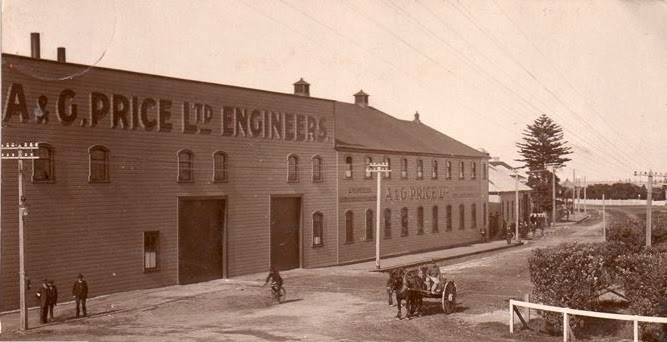 Below, an enlargement of the Halcyon Goldmine Company buildings, Karaka Creek, Thames. 826 oz. of Bullion yielded. Total value of Bullion, 2,381 Pounds. A description and map of the location of the mine is in D Wilton's article on the Lucky Hit Creek. "The DSC of 19 October 1869 notes: 'We are glad to note the Halcyon machine (approx 1km downstream of the junction of the Lucky Hit and Karaka streams) at work on several lots of quartz taken out of the Golden Bar claim, Lucky Hit Spur' and: 'The reports to hand from the Star of Fermanagh, Lucky Hit Spur, are most favourable.' The article finally went on to note: 'In conjunction with the adjoining Adelaide Company, the Lucky Hit Company has constructed a road and tramway along which to convey quartz to the Lucky Hit machine.'" Your chance to see the great trains that were produced by A & G Price of Thames. Maybe your ancestor worked on these trains, sit back and enjoy seeing them in action. Remember the stories of steam train trips - don't forget to put the window up before you enter the tunnel!!! Lions' Heritage sign on Burke Street, Grahamstown, Thames. 'A 428' a return trip, Another view of the Weka Pass express. A night train special. A tour of the train. V148: was built by A&G Price in 1943 and features in this 2014 Steam extravaganza at 4min 45sec and in this 5 minute clip. Another view of the V from Prices of Thames. Price Loco at Beaver Station. 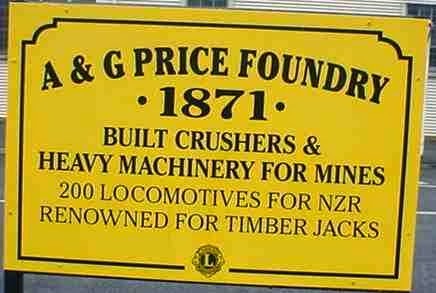 Ab 699: In August 1922 A & G Price of Thames NZ delivered another new steam locomotive to the New Zealand Railways. It was of the Ab class numbered 699. Another video at Pleasant Point. NB. There are a lot of train videos from Pleasant Point featuring Ab699 - search at YouTube. A delightful find in a book called: New Zealand's Historic Samplers our Stitched Stories, by Vivien Caughley. 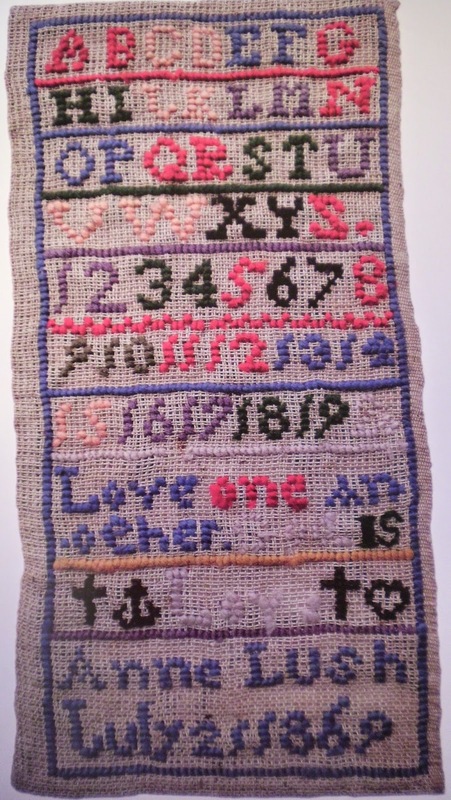 It is the sampler of Anne Lush (1857 - 1937), who lived at The Thames a short time after this sampler was completed in July 1869. Anne Lush had stayed in Auckland with her mother and family at Ewelme Cottage in Howick, while her father the Reverend Lush settled in Thames as the Anglican Minister. 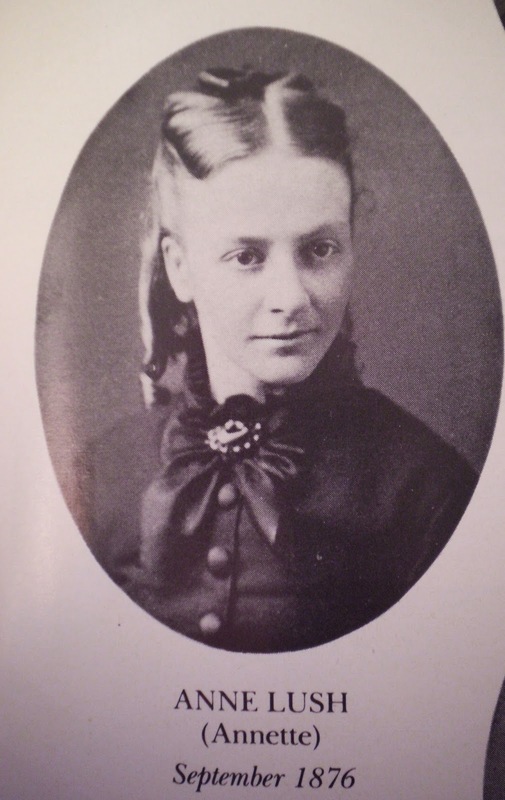 The family then moved to Thames, where Anne became an active member of the community - this included teaching at the Kauaeranga Girls' School and at the St George's Sunday School. Photo of Sampler from: New Zealand's Historic Samplers our Stitched Stories, by Vivien Caughley. 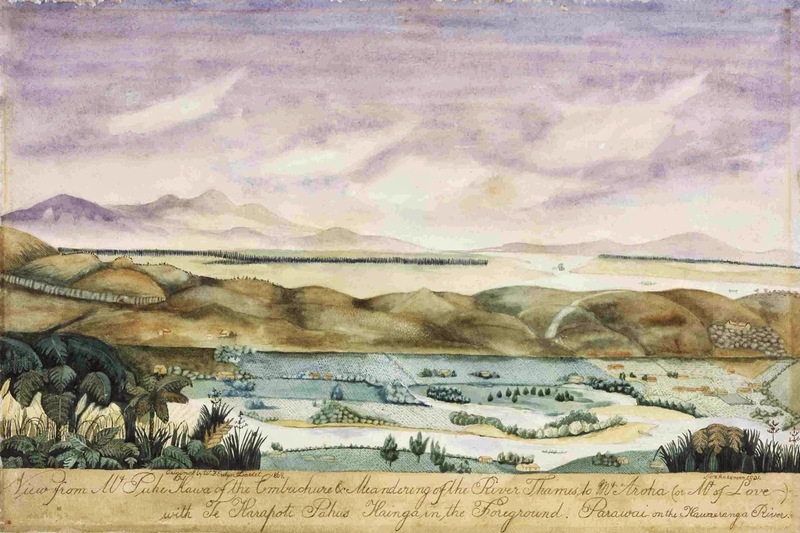 A beautiful early painting of the Parawai to Te Aroha landscape. Originally painted by Wilbraham Frederick Evelyn Liardet, (1799-1878) and later copied by Nora Anderson 1901. Liardet was the first European settler at Port Melbourne (Sandhurst), Australia in 1839. Description: View from Mt Pukekawa of the embuchure and meandering of the River Thames to Mt Aroha (or M[oun]t of Love) with Te Karapoti Pahus Kainga in the foreground. Parawai on the Kawaeranga River. Extensive view framed by tree ferns and flax in the foreground, looking down unto a small river winding through cultivated fields and scattered houses, with the kainga mentioned in the title presumably the cluster of buildings to the right. There is a ridge of low hills beyond the near river valley then the extensive plain of the Waihou River, formerly called the Thames, with mountains in the distance. The Thames River, named by Captain Cook, is now known by its original Maori name as the Waihou River. The "Kawaeranga" River is the Kauaerangi. Mt Pukekawa does not appear to be a name used in the area depicted any longer - the closest Pukekawa is some 50 kilometres to the west on the far side of the Waikato River. On the verso is a pencil and faint watercolour drawing of a pair of pink dancing shoes and a fan. Owned by Warren Sisarich, 1960s. Sold at Dunbar Sloanes, Wellington, to Dr Neville Hogg of Dargarville. Purchase by the Library from Dr Hogg at Webb's Auction, Auckland, August 1993. 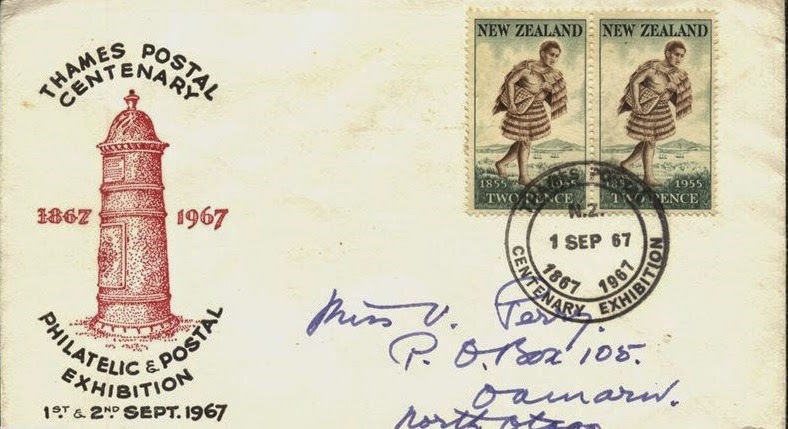 A First Day Cover online today at Trademe auction site - for the centenary of Thames Post 1867 to 1967. The Post Office at Shortland Town, Kauaeranga was firstly at the store of Mr Francis HOLLOWAY, who was appointed as Postmaster. 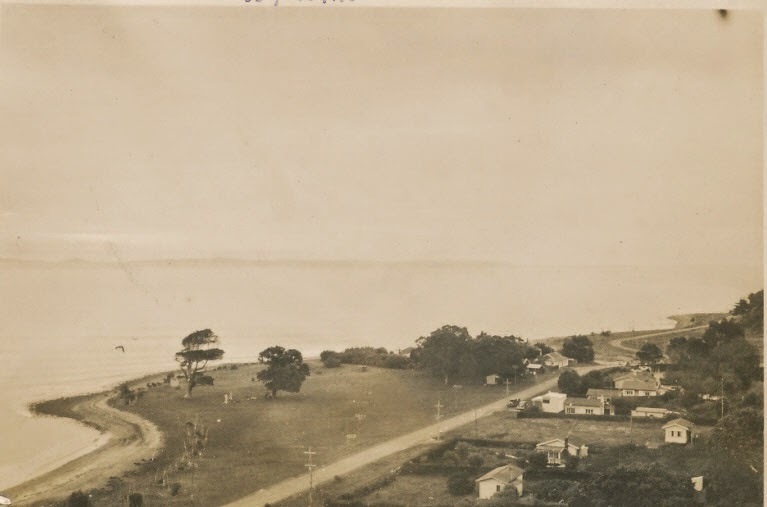 Older Thamesites and visitors to the coast, may remember camping on the Waiomu Domain or the large picnic gatherings that were regularly held at the bay. 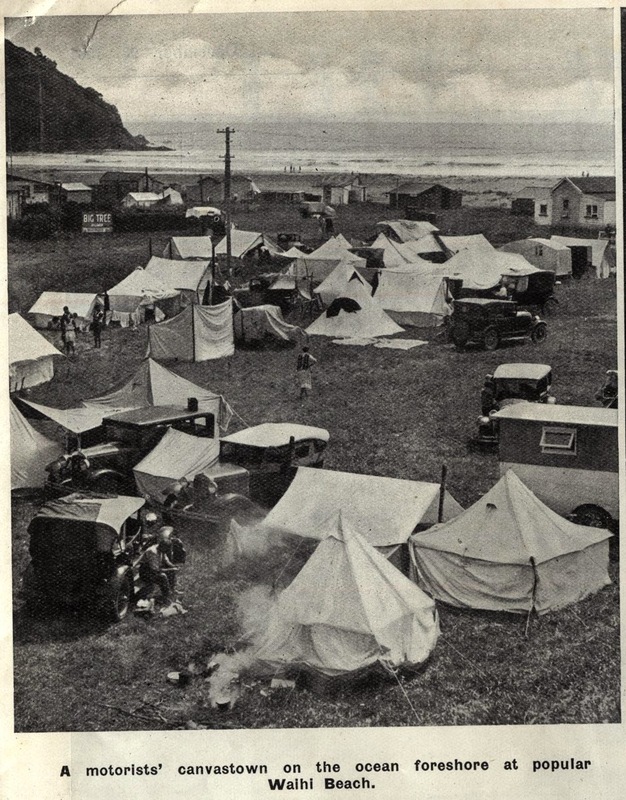 While others may have stayed across the creek at the Waiomu Bay Motor Camp. The camp is now closed, having been ravaged many times by the floods. 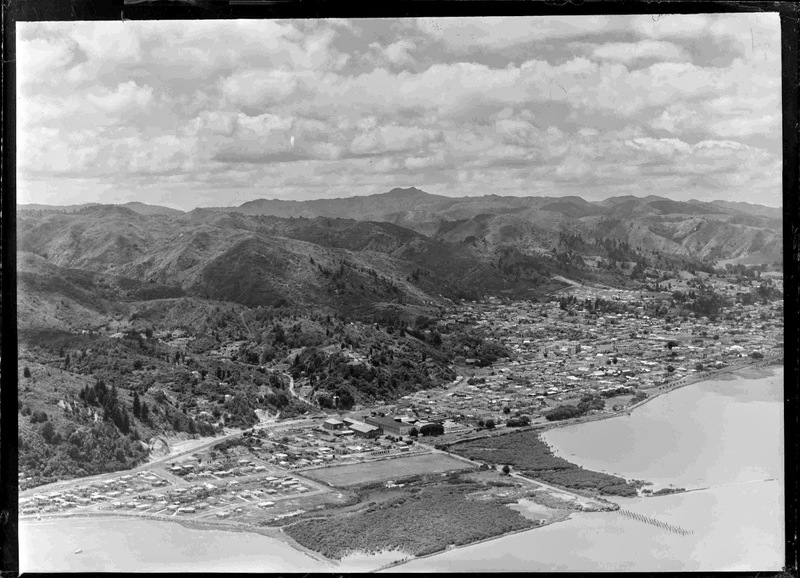 Above: Waiomu, with the Domain area on the left of the road. Following a comment from facebook, thought it was timely to remind folk of how the town looked before the reclamation. The beach area long filled and extended with mine tailings, rubbish and landfill, have us with the area known as the Moanataiari today. Who can remember back to going to the 'dump' and seeing it move places until finally all the land was filled. The land was developed and before you knew it houses began to appear! 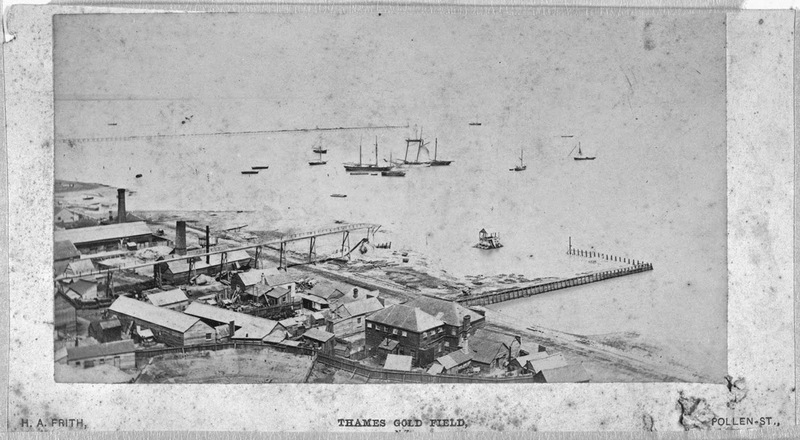 Description: Showing the Thames Goods Wharf with the Moanataiari Flume in the middle. 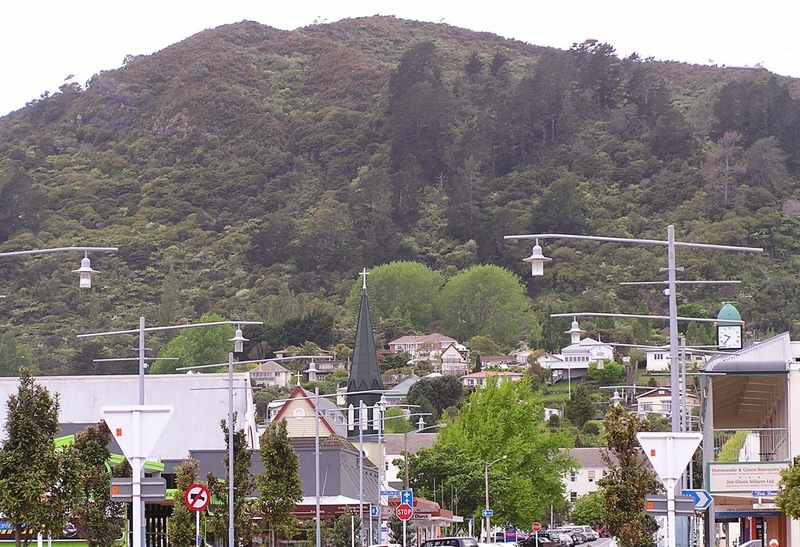 The large building in the centre is the Kuranui Hotel. All of the are containing shipping is now reclaimed. One hundred years ago, the people of Thames were busy preparing for Xmas - but this was a new age for many with the war in Europe continuing to escalate. It was reported that Germany had 'called-up' all fit men aged 17 to 45 years of age. Mr Bongard the chemist, was selling a tonic that might help Thamesites through the xmas season. If you spent more than ten shillings at Hetherington's, you got a free gift for xmas. A Court & Son, had special discounts depending how much the customer spent. The people of Augustus Street had written to the Thames Borough Council wanting to know when they were getting electricity. Other Borough news - they were to allow the Thames Jockey Club the use of the water cart to keep Parawai Road watered between race days. 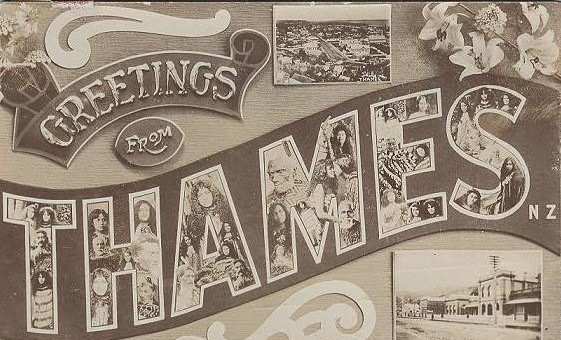 A selection of Thames Hotels were trying to woo the holiday makers, offering them a great stay at their establishment. They included: Mr W Bright at the Royal Hotel; Mr R E Price at the Pacific Hotel; Mr A Kerr at the Wharf Hotel; Mr A Thomas at the Cornwall Arms; and Mr W Canner at the Shortland Hotel. Banks were to be closed from Xmas Day until and including the 2nd January 1915. There had been a fire at the '2 C's Restaurant' owned by Mr Carrington at 1.45pm this afternoon. Damage had also been caused to the adjoining shops of H Lowe (Butcher) and Mr Collins (Confectioner). Amongst the news was the amazing discovery of an ex-Thames man, Mr W [Walter] OVEREND. He had found a way to solder aluminium, that people had been trying to discover for the past century!!! 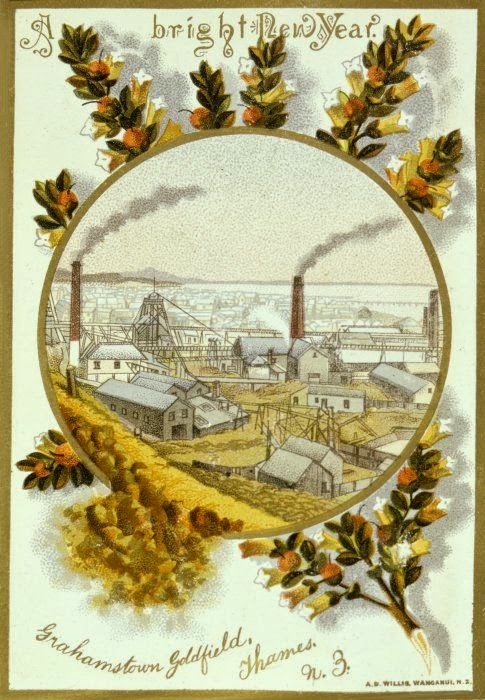 From the time the goldfields opened, the backdrop known as Una Hill or simply the Una - was a hive of activity. Mining all up the Karaka and in the ranges beyond. It didn't take long for the hills to be barren from the mining and littered with tracks and tramways. Looking over Karaka Creek, Thames, showing Una Hill in the background, with Una tramway leading down to Una Battery. The Battery is the twin building with a brick chimney and overshot waterwheel. 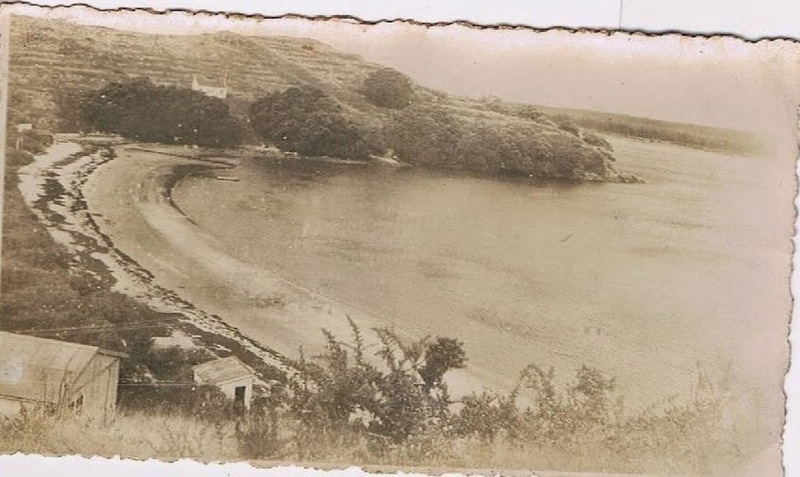 The dark roofed building in the right foreground is probably Scanlon's Battery. There is a tramline in the foreground. Take a closer look above at the housing and living conditions of the miners and their families. 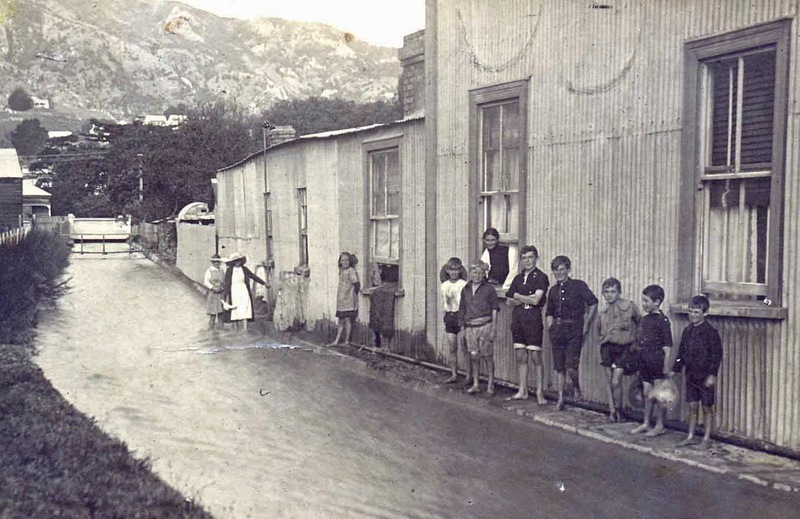 Many miners lived up the Karaka.